24 hour iPhone battery seems like a dream to achieve. And though other firms pay attention to fast-charging and a bigger battery, Apple ensures its resources help iDevices function longer in a completely different manner. Without a doubt, they’ve done a great job, but quick-charging is indeed important in several instances. For example, it can be handy when your device is draining the battery and you still need to do a lot of things on mobile. Here’s a secret that you might not know. Apple officially supports (fast charging) – it’s just that they never officially made a statement about it. Fast charging is a capability in specific SoCs (mobile-based), and allows devices to be fully charged at a much quicker rate than the traditional USB charging rate. However, the supported device has to fulfill two requirements for it to be eligible for fast charging. 1) The charger should have a high power output. 2) The iPhone or another iDevice should have enough capacity to draw the power. To help you better understand the technicalities around this concept, here’s a detailed explanation. 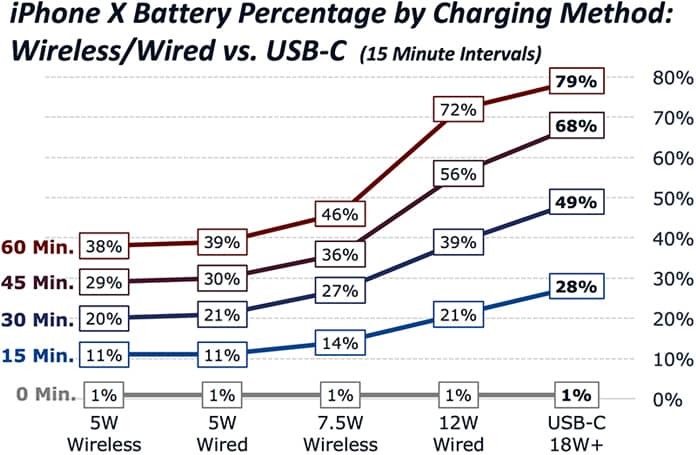 Charges for smartphones are often rated based on their P (Power output), which is measured in W (Watts). The watts in turn is are a byproduct of two individual factors: I and V. I stands for Current and it is measured in A (Amperes). V stands for Volts. Know this: A USB 2.0 port of a standard laptop can offer a 500mA current output while 900mA current is offered by supplies of USB 3.0 – both operate around 5V. If an iPhone can draw a current of more than 2000 mA, you can label it as fast charging supportive. Though most iPhone models are being shipped with the usual charger of 5W (5V Output – 1000mA) straight out of the box, a few models can draw a current of 2100mA, and therefore invoke fast charge. The following list of iPhone devices support quick-charging: iPhone 6, 6+, 6s, 6s+, 7 & 7+. While Apple released the SE model of iPhone after the iPhone 6s Plus and 6s, it has the capacity to draw a current of 1000mA. Therefore, it’s not capable of fast charging. Hence, a charger that’s rated 2100mA or above will allow fast charging for any of the models of iPhone mentioned on the list. The 12W and 10W USB chargers from Apple both meet this criterion. 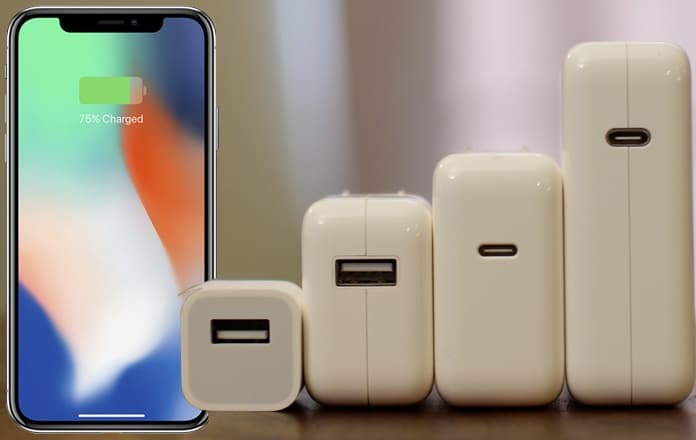 In addition, extra power – till 2100mA in case of iPhone, can be requested by Apple devices when charging through Mac’s USB 3,0 ports, which are also capable of quick charging. Note: In addition to charges, the charging speed may also be affected by USB cable, as the current supply from charging units can be limited by higher resistance cables. Therefore, make sure to buy a high quality cable that supports a current of at least 2.1A. Is It Safe to Use the Fast Charging Option for iPhone? It is, indeed. But make sure the device’s C-rate is near 1C. C (C-Rate) or Charging Rate measures the rate at which the device’s battery is being charged relative to its battery capacity. For example, if your device has a 2000 mAh battery, and it is able to draw a current of 2000mA, and takes 2 hours to charge to a full volume, the charging rate (C) is going to be 1. iPhone models that support quick-charging have a C-Rate between 1.16C – iPhone 6 – and 0.7C – iPhone 7 Plus – which is in between the safe zone. Author of Batteries in a Portable World and founder and CEO of Cadex Electronics, Isidor Buchmann, stated that battery vendors would recommend consumers to remain below 1C, but even if they go slightly above, there’s nothing to worry about. And if you’re still thinking, it’s quite safe to use chargers that are higher rated. That’s because an iPhone draws maximum current till its capacity, regardless of how much current is supplied by the charger. For similar reasons, 5s and previous models, along with the SE models, do not have fast charging capacity, even if they’re used with 10W (2100 mA) chargers. Note: If you’re thinking of purchasing a brand new power bank, make sure it has support for the output current of 2.1A, because that’s what qualifies it as a quick-charger. If you already own an iPad, check if it shipped with 12W or 10WW USB charger, as these can be used for fast charging devices. You can check out power ratings on this page. The iPhone X, 8 and 8 plus have a built-in fast charging feature. If you want to enjoy this feature, you have to buy a USB C adapter and USB C to lightning charging cable. Aside from understanding all the information mentioned above, you can follow tips from UnlockBoot for maximum your iOS device’s battery life.